ScopeTester is a small application for testing the serial port response of Meade Autostar, LX200 or LX200GPS telescopes. This app was developed to test some specific features, but you might find it useful or entertaining. Usage is self-evident. If you don't find it so, please feel free to ask questions. 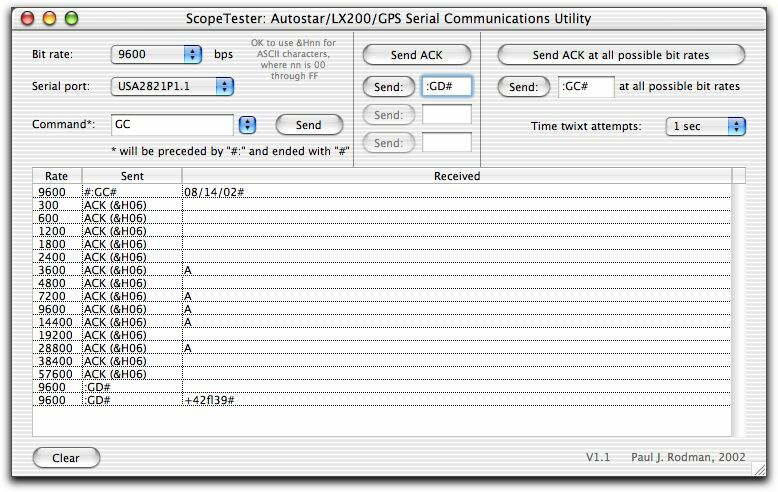 ScopeTester is Freeware. Use it at your own risk. If you would like to support my astronomy obsess..., er hobby, and feel this application has some value to you, I always gratefully accept donations. Creating software like this requires lots of time and expensive software and equipment. Note: Although ScopeTester is freeware, please do not post the files anywhere else without permission. Feel free to point anybody at this page or publish the URL publicly. ** This is a self-expanding file. Can check incoming text for match against given text (or, optionally, a regular expression). Will beep and/or highlight the text.